The cult-favourite burger joint will give away a year's worth of free food to the first 50 customers. Last year, Carl's Jr hit Victoria for the first time, opening its debut store at Knox in October, and another in Cranbourne soon after. Now, in a move that proves the cult-favourite American burger chain is here to make a mark on our famously good burger scene, it is opening its third Melbourne shop in Docklands this week. And to seal the deal, it's offering some pretty sweet freebies to its keenest city customers. 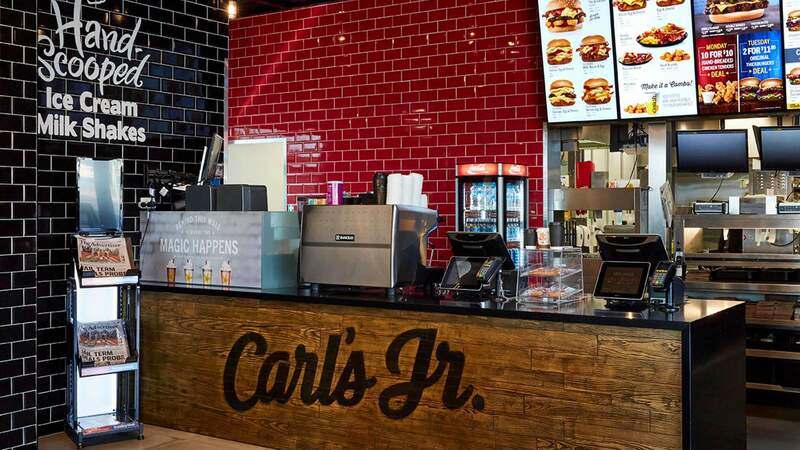 Setting up shop within The District Docklands' dining precinct, where Archie Brothers Cirque Electiq is, this new city edition of Carl's Jr will be dishing up its signature menu of 'American classics' and monstrous burgers that have earned it a heap of fans overseas. We're talking the aptly named Thickburger, teaming an angus beef patty with extras like portobello mushroom, or bacon and guacamole, alongside hefty chargrilled numbers such as the Double Western Bacon Cheeseburger. The Big Carl's rocks a double patty and oozy American cheese, and chook-lovers are sorted with seven different chicken dishes. Then, there are breakfast options for the early birds, salads for the virtuous and some pretty solid sundaes and shakes for dessert. If you think you can handle that sort of fare, for free, all year long, then start lining up at the new store ASAP. To celebrate its grand opening, the first 50 customers through the door from 9am on Thursday, February 14 (yes, Valentine's Day) will score a book of Carl's Jr coupons, to use on free menu items every week for the next 12 months. You will definitely need to get there early. The new Carl's Jr store will open at The District Docklands, 440 Docklands Drive, Docklands at 9am on Thursday, Friday 14.